Throughout my childhood I’d seen my mother do needlework and learned from her by example. I can’t remember exactly why I was home from school that week. I think I might have had the mumps, or was it after I had my tonsils out. Whatever. I wasn’t allowed to go outside and ride my bike, climb trees or pet the neighbor’s pony. I’d read all the books I had at home. I was bored to tears and probably so was my mom who was stuck at home with me. So mom put me to work with knitting needles, crochet hook and yarn. Frankly I was glad to go back to school. Fast forward to over a decade ago when I went into early “retirement”. The radio station at which I was employed was sold to a Spanish language company, my insistence that I could learn Spanish fell on deaf ears, and I found myself in the absurd state of having no job, an empty nest and nothing to do. I put myself to work with needles, hook and yarn. This time the crochet spoke to me. I was just a hobbyist, a dabbler in the craft, but well on the way to becoming an obsessive fiberazzi (fiberazza?). Like you I crocheted holiday gifts for everyone, afghans for every baby shower, sweaters for the dog. One day on a whim I posted an image of myself in a shawl that I had made (I didn’t realize then that I had “designed” it) on the Lion Brand Yarn customer gallery. It got so many hits that I was asked to submit the sample and a pattern. They even offered to pay me. Money. Well HELL YES! As an author I have four crochet design books with Potter Craft. I also write technical articles and essays for magazines and newsletters.As a proud and avid Professional Member of the Crochet Guild Of America, 2016 inductee into the CGOA Jean Leinhauser Hall of Fame, I hold a CGOA Masters in Basic Crochet. I earned status as a Craft Yarn Council of America Certified Crochet Instructor. And I am an Associate Member of the industry organization, The National NeedleArts Association. If you put tags on all of the hundreds of my published designs, the heaviest hits would be: crochet, lace, seamless top-down construction. Those three attributes pretty much sum up what I do. I specialize in garments and accessories for women, mostly because men don’t wear lace. With few exceptions my designs are virtually seamless, no sew, meaning when you’re done crocheting, you’re done. Top Down Seamless Crochet: the Workshop, from Interweave/Crochet Me, available as a DVD or download. Foundation and Crochet: Intro to Chainless Foundations, the Webinar, from Interweave/Crochet Me, available on demand. My latest venture and the scariest thing I’ve ever done is launching my own self-published pattern line, DJC Designs. Available exclusively at DesigningVashti.com, the ultimate crochet destination and pattern boutique owned by my friend Vashti Braha, DJC Designs lets me explore territory not possible in traditional publishing venues. Coming soon is the expansion of the companion line, DJC Designs, Too!, a collection of seamless garments sized for girls, tweens and teens. Over the years I have been interviewed a few times. Though I know I should be more circumspect in my response to questions (even when the interviewer is a good friend… especially when the interviewer is a good friend!) I end up spilling my guts anyway. 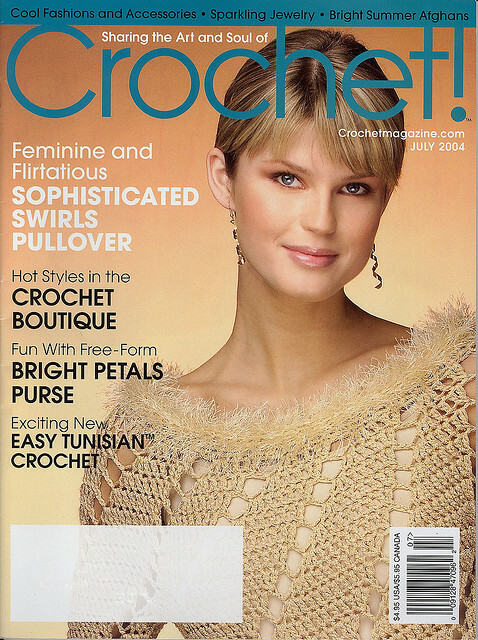 Crochet Insider, a phone interview I did with Dora Ohrenstein in 2006. Knitting Daily TV, Episode 208, I appeared with Kim Werker and demonstrated seamless garment construction. Older series of this show crop up occasionally on public TV; also available on DVD. Knit and Crochet Now! TV, Show 213; speaking with Brett Bara about exploded lace; the companion project Light and Lacy Top is a free download, but you must sign up and sign in to get the pdf. Getting Loopy, the blogtalkradio show with Mary Beth Temple, I was one of her first guests, 6 May 2008 episode. Knitcircus, Winter 2010; the first crochet designer interview for this primarily knitting e-magazine. While at TNNA, Columbus, June 2011, I talked with Stacey, head of the Independent Designer Program at KnitPicks, about Pam’s Comfort Cables. I sort of got ambushed and wasn’t prepared (in other words I look like hell!) but this was such a great project and such a nice reception at KnitPicks, so here I am being interviewed on camera. An interview I did with Kathy Elkins, owner of WEBS, the most awesome yarn store on the planet, for the WEBS blog podcast Ready, Set, Knit #228, 23 July 2011. I am working on the Chamomile Cardigan with the broomstick lace pattern. I am stuck on row 5 of the Yoke. I am not sure about creating the sleeves. It says to work in the front and the back. But I am confussed. Please help!!!! Hey Chrissie, Thank you for your interest in this design. I do not give pattern support on this blog. Please join me and the posse at Ravelry.com and post your questions at the forum dedicated to my designs, Doris Chan: Everyday Crochet. If you are not on Ravelry, it is a free fiber site and it’s where we play. See you there. Doris – I hope you remember me from high school! I would love to catch up with you, Suzanne…next time on the east coast. I finally ditched the corporate world several years ago just to do art. Saw Nancy Kintisch a few years ago in L.A. I used to design and hand paint needlepoint for 10 years, then got a “real” job -learned all my needlework from my Grandmother! So glad to meet you Miss Chan, your story sounds like mine. I started crocheting as a pre-teen to chase boredom and fell in love with the art. Throughout my life though I have not had much time to pursue it with the enthusiasm as I would have liked. However now a days I am forced retired and I picked up my hobby again as a means of looking busy while I ponder my life and my future. To say I love lace is an understatement. I begun again making afghans, but soon became bored, then one day while browsing the net I came across one of your patterns, a beautiful lacy top which I made for my oldest girl. I was impressed with your precision and the fact that this garment was seamless from start to finish. After that I went in search of more of your work and came across the pearl river shawl which I am currently working on in Paton’s Lace with sequins for a dear friend. Just as you described the art of crocheting and dealing with the tangles and knots of the yarn etc. so has been the experience with the peice. Mainly I suppose because Paton’s lace yarn is a blend of mohair, wool and acrylic, (and not the bamboo which you used) so when you miss a stitch or miscount, unravelling it, is a nightmare. I have considered tossing it aside in frustration many times but when I got through the first 13 rows finally, it was so georgeous that I just couldn’t stop. Working with yarn is like the journey of life in so many ways but as you encounter the difficulties along the way it is necessary to remind yourself of the desired goal (success) so that you can’t stop going. So I look often at your finished product to keep myself inspired. I have also decided to pace myself a bit, since the yarn is bulky and the project requires extreme concentration so as not to miscount the sc stitches, then throw off the broomstick lace count which has happened. Meanwhile I am so excited by your wearable lace creations that I have purchased two of your books. I plan to put every woman I know in one of your designs. I look forward to joining your website for future updates and information. Thanks for sharing your unique talent with the world. Can you help me? 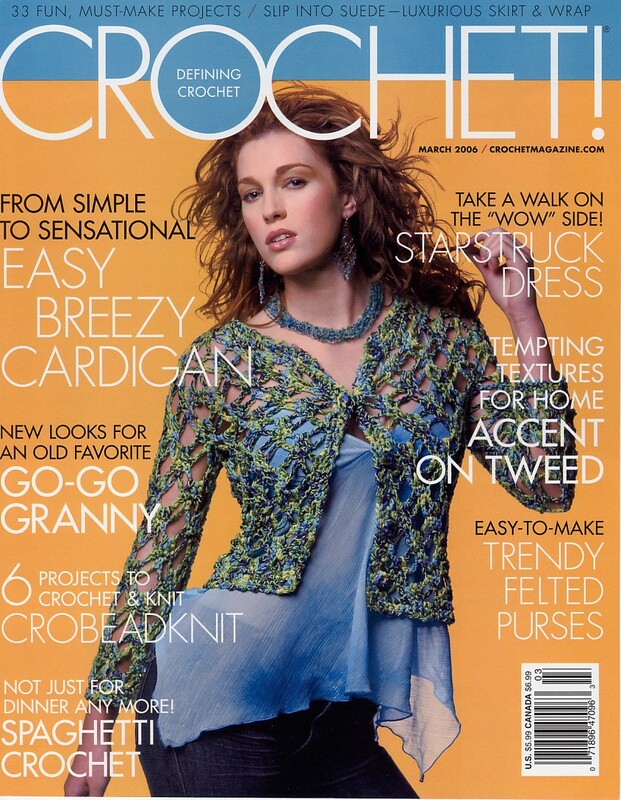 I just purchased your book “amazing crochet lace” and am trying to make the blue curacao shawl on page 137. I’m having a problem with row 11. I think there is an error with the rep from ** twice. Also row 10 says to rep from * 3 times, but I think it should be 4 times. Please help. Hi! Merry Christmas. I have crocheted several of your patterns, and really like your work. With that said, I have a love for lacy patterns, and I’m finding it harder and harder to find really great crochet patterns like some of the newer lacy knit patterns. So, my first question is are you fimilar with any crochet pattern simliar to the knitted out today? Second, I just found in the used book store, a book from Needle Craft, which shows knitting and crochet examples, patterns etc. Basically, a how to move between the two and what the looks with be. Since alot of the knitted lacy patterns are in a graph form is there a way to convert them to a similar crochet graph (like filet)? Thank you for your time and assistance. Keep up the great work. Thanks for your interest. I do not field questions on this blog; it’s not set up for individual exchanges. Please join the posse at Ravelry.com. Once you’ve signed up, you’ll be able to post your questions on the forum dedicated to my designs, Doris Chan: Everyday Crochet, or simply search the site for answers. interesting blog with an amusing presentation. I have three skeins of Lion homespun and was looking for some design. I came across your pattern DJC shawl on internet using the yarn in funky version. I liked the lace at the bottom, would you recommend to use home spun to go for the chunky version using home spun or I should avoid it..haven’t used home spun earlier..pl advice.. Thanks for your interest in All Shawl. I wrote that pattern with many options so that crocheters would be empowered to use virtually any yarn to crochet any version desired. Yes, your idea will work just fine. Happy crocheting! Thanks Doris…the shawl worked out awesome…. I have purchased City Crochet and want to do the Tokyo Vest. I have done a lot of Tunisian but can’t figure out the mesh stitch, I ordered 101 Easy Tunisian Stitches as I was told it was in there but I can’t seem to find it. Would you be willing to do a You Tube demo on the mesh stitch please? Not at this time. Please check Ravelry.com at the forum dedicated to my designs, Doris Chan: Everyday Crochet. There has been discussion and help for this design. Avalon is designed with NaturallyCaron.com SPA. You’re good to go. hello, i found your blog thru a link on ravelry which took me to your old blog. now that i’ve found it, i’ll return often! just a suggestion, you might want to change this link to take the reader to the correct current link at the new pattern link so that some not so savvy webbies can get to the right place for this pattern, thanks! I do know how to crochet but I do not know how to read a pattern. I can follow if I watch a You tube video or watch someone else crochet. I am a visual learner. I can copy things pretty well. Can you recommend a beginner book or something with good explanations?? I get that DC is double crochet , SC is single crochet etc. Directions written in words is so confusing. You have beautiful designs and I would love to be able to make some of them. FYI: I learned to crochet watching my Irish Grandmother making doilies out of STRING. This could be my first mistake!!! Im Nadia, just saw on raverly.com amazing crochet lace “blue curacao” and i really like it! want to do the same! Please, can you help me and send me a scheme of how to do it! Thank you! The design Blue Curacao is from my book, Amazing Crochet Lace (Potter Craft, 2006). 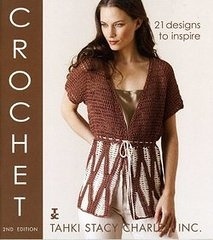 Please see the book for the pattern in order to crochet this. Hi Doris, I purchased a pattern of yours, Snowflake Beret from Interweave. In the instructions I am stuck on round 4. It states Ch 3 (counts as dc), 2 dc in first ch-sp. Ch 3. Here’s where I’m stuck (sh in the next ch3 sp, ch 3) what’s sh? It doesn’t have a translation in the glossary. I can’t even begin to make something up at this point. Please help. 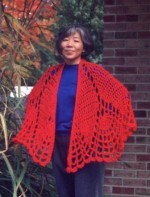 Doris I have purchased your cats cradle shrug pattern my question is I will wear a 2 in it but want to make the yoke like the red one you are wearing how do I do that? I don’t want so many double crochet rows as the pattern calls for. I think the red one is more dressy and want to make this to wear to a wedding. I do not give pattern support help on this blog; this type of comment format is too clumsy for detailed pattern explanations. Please join us at Ravelry.con, on the forum dedicated to my designs, Doris Chan:Everyday Crochet. If you own this pattern, then you will find this link in there. Thanks for your interest in this design and for your understanding. Hi Doris, I really enjoy your work. I could have sworn I saw you on the street in Portland, OR a couple of weeks ago. Is that possible? 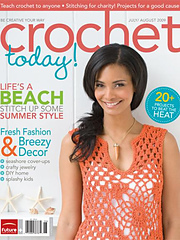 I really like the Draped In Lace Vest in the Spring 2013 issue of Crochet Magazine. I am having trouble reading the instructions. I wonder if you could help me in that in most patterns you stat with a chain this one does not have one. If you could clarify the pattern for me I would appreciate it. Thank you, I got the info I needed at Crochet Talk. Now I will get busy making the vest. Loved your work! I’m starting with crochet… always been a knitter, thank you so much for sharing your skill! Love from Argentina. 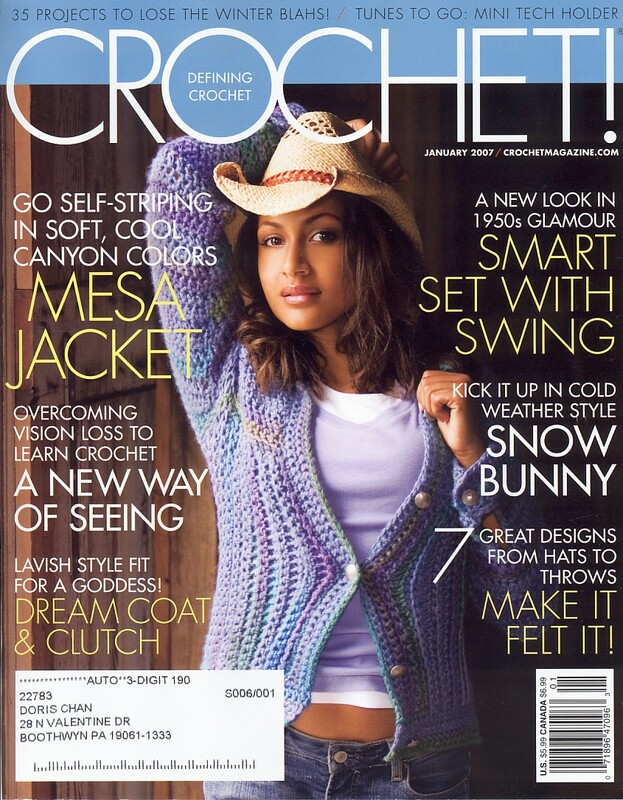 I’m a journalist writing for Simply Crochet magazine in the UK and I would love to carry out an email interview with you about your designs. Would that be possible? Thank you so much for sharing your considerable talents with those like me of such limited ability – this site is absolutely inspirational! hi,i m urvi from india.i love ur all crochet design.plz learn me lacy sweater pattern. Doris Chan, you rock!! Just discovered your patterns when I checked out one of your books at the library. Now I want them all. 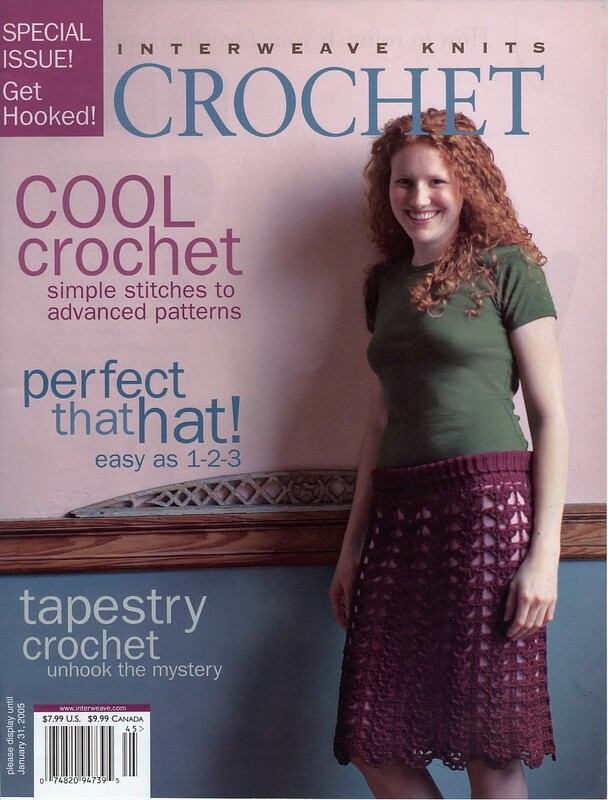 I love your crochet lace patterns and the yarns you choose. Looking forward to your girls, teens, tweens patterns as I have 2 girls. Doris – I have been searching in vain for the pattern for the pineapple edging as shown for the Long Version of your All Shawl. I have made the All Shawl several times with the edging as described in the download but would really love to be able to do the pineapple version. Hey Joanne, The edging for the long version (blue) is the same edging. The edging stitch is a sort of mini-pineapple. It seems big because the gauge for the long version is exploded (loosened). Perhaps because the yarn is textured, and also because it is photographed with so much contrast, it looks different, but trust me, it’s the same. Dear Mrs. Chan… I love your patterns! 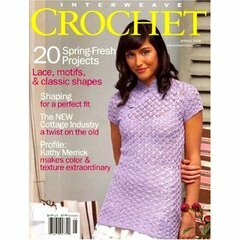 I recently came across an amazing crochet dress, but cannot find the pattern – only diagrams. Is it one of yours? If not, how do I find the pattern in written form? It’s called ‘wildflower crochet dress’. One site says it’s by Naomi k sills, but I found nothing else by her? My name is Ben Perreira, I work for Harper’s Bazaar. Do you mind sending me an email? 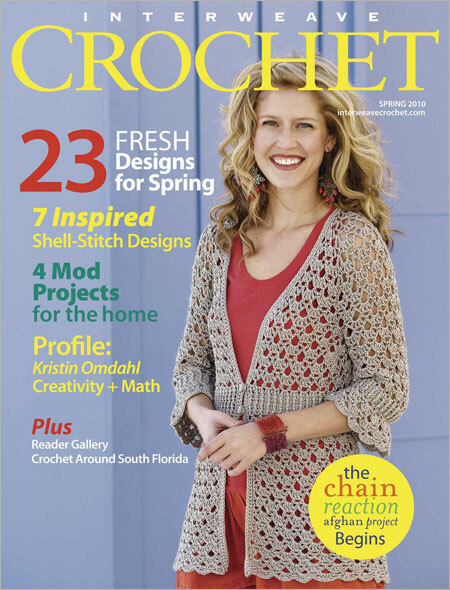 Did you design the Crochet Lacy Cardigan pattern for Patternworks? I purchased the pattern and some yarn from Patternworks, but I have a question on how to start the pattern? Is there a way to reach you to just ask you a quick question about this. E-mail perhaps? Hey Debbie, I do not answer pattern questions on this site. Please join us at Ravelry.com, a free site for fiber enthusiasts. After you’ve signed in, come to the group and forum dedicated to my designs, Doris Chan Crochet, and post your questions there. The posse will be along soon with answers! Thanks. I am completely flabbergasted at your designs …. I started to crochet a year or so ago (now 61 years old), and what an inspiration you are! Is there a pattern for the sailing rope look that you have at the top of your website …. I can thing of so many ways to use that as I have a lot of sailors in my family and it would make quite a lot of things look ‘cool’! Hi! I am doing a school project on crocheting and I need to contact an expert on it. Would you be willing to participate in an interview via email for my project? Thank you. Doris, you are a true remarkable crochet genius! You’re my favorite designer! I live crocheting and wearing your clothing designs. You’re and amazing presense in the worls of crochet and we are all so blessed to have your talents leading the way to countless hours of joy, beauty and humor! I am disabled and therefore spent much of my time in a recliner crocheting. So, I want to thank you for helping me to keep my sanity and happiness in tact! God has blessed me with a wonderful husband and your talent to keep me going. Thank you! Hello, Megan! I believe three ply would be appropriate for this design. Please take a look at the US list of yarn standards and guidelines here. Compare the information on the chart to the labels from the yarn you’re considering. If your label has no crochet gauge, try comparing the knitting gauge. Generally, from what I understand, 4-ply is our medium worsted (CYCA ball band #4 Medium), aran is a heavier worsted. The yarn used for Zen is a sportweight, but a lofty one, between a CYCA #2 Fine and a #3 Light. It is also discontinued, to my dismay. But, whatever the charts and labels say, please use the yarn that best matches the stated gauge and hook, while giving you a fabric that you like. Sorry I cannot be more helpful! Hello Ms Chan, I love your work and am having trouble finding pattern for the pink shawl at this page on Ravelry http://www.ravelry.com/patterns/library/crochet-shawl Could you please tell me how I can purchase it, online would be best as I’m in Australia. Thanks in anticipation. Hey Sharyn, Thanks so much for your interest! A version of this shawl using sportweight (2 ply) instead of worsted weight (4 ply), with the same stitch pattern, featuring improved shape, is included in the pattern set DJC: Lotus Wings, an independent design available at DesigningVashti.com. I would like to personally congratulate you as your blog Doris Chan Crochet has been selected by our panelist as one of the Top Knitting blogs on the web. I personally give you a high-five and want to thank you for your contribution to this world. This is the most comprehensive list of top Knitting blogs on the internet and I’m honoured to have you as part of this! My name is Emmanuel, I just want to let you know that you are a wonderful teacher and designer. I recently paid for your Top Down Seamless Crochet: the Workshop, from Interweave and I have successfully completed the sweater twice, for my wife and one of my daughters respectively. I was just wondering if you have any similar Tutorials or Workshop on how to construct men’s crochet sweater? I will really love to crochet a well designed sweater for myself. I love your patterns. The designs are always so elegant. I’m currently making the Galena sweater, and I have a question. Is there someplace where you have a question and answer section? Thanks.